AS the haunting sound of a remixed Heart of Glass by Blondie soars up into the vaulted arches of the Oratoire du Louvre, the silhouette of a woman appears against a blood-red background wearing a sleek gown of black feathers. 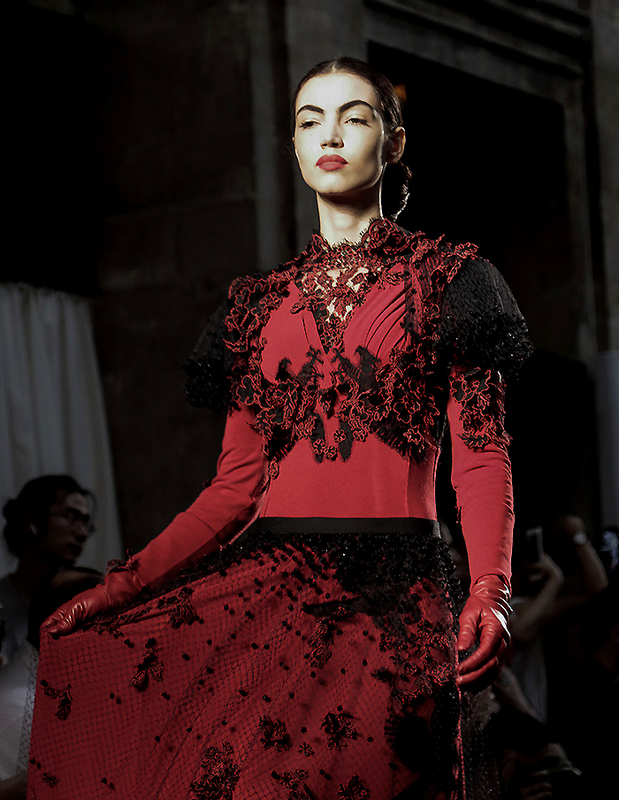 She is the first of the sultry femmes fatales to appear on the runway. 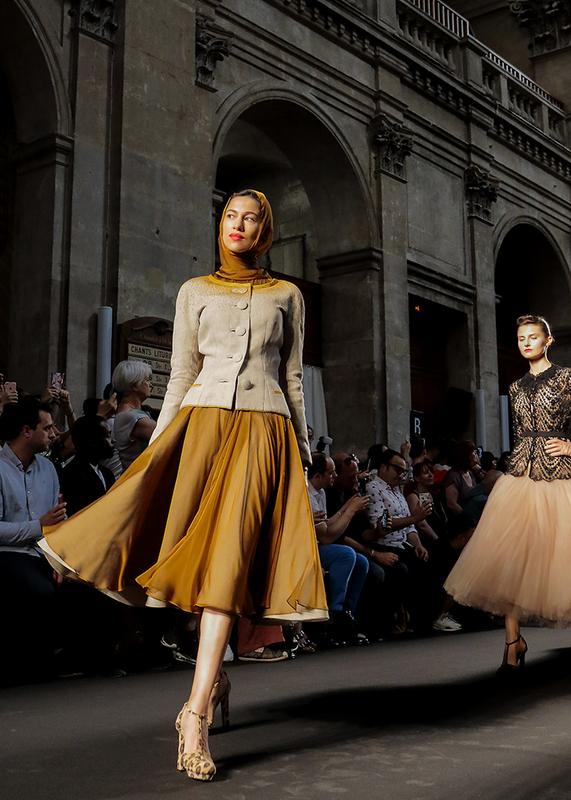 Like heroines from an Alfred Hitchcock film, played by Grace Kelly, Tippi Hedren or Kim Novak, the models walk haughtily down the runway of Julien Fournié's dramatic haute couture show. The designer has used Hitchcock's famous quote: "Suspense is like a woman. 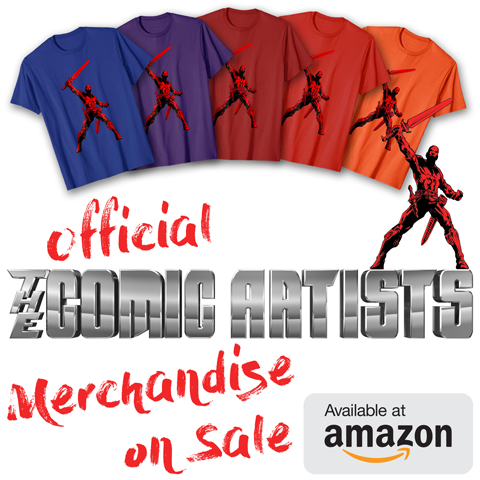 The more left to the imagination, the more the excitement" ~ as a leitmotif for the collection. The couturier encourages you to wonder if the impassively beautiful women with their figure-hugging, chic clothes are the hunter or the hunted. Called First Crime, the collection is inspired by film noir masters such as Hitchcock, Agatha Christie and Paul Verhoeven and the clothes have suitably anatomical cuts that cling seductively close to the body. The feathered black dress that opens the show has a 1950s silhouette with a slim waist and wide A-line skirt that shows the extraordinary handiwork of Julien Fournie's Paris ateliers, including the beautiful embroidery and sequins, all made in-house. This is Mr Fournié's best collection yet ~ cohesive and engaging with cleverly sculptural drapery and beautifully cut asymmetrical bias inlays. The colour palette is equally dramatic with a mix of ruby red and dark blue contrasted with fawn. Fabrics include mohair, silk and chiffon with several gowns and a pantsuit covered in a cascade of rippling sequins that subtly change colour from burgundy to violet and blue. 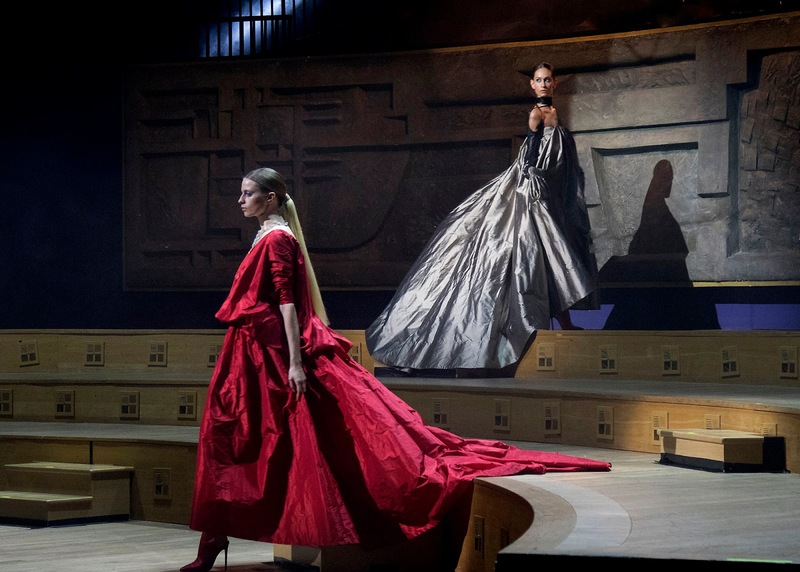 The designer says the collection was also inspired by the television series The Handmaid’s Tale and particularly the characters Offred, played by Elisabeth Moss and Serena Joy, played by Yvonnes Strahovski. The couturier wanted the designs to be very clear cut and free of obvious embellishments. 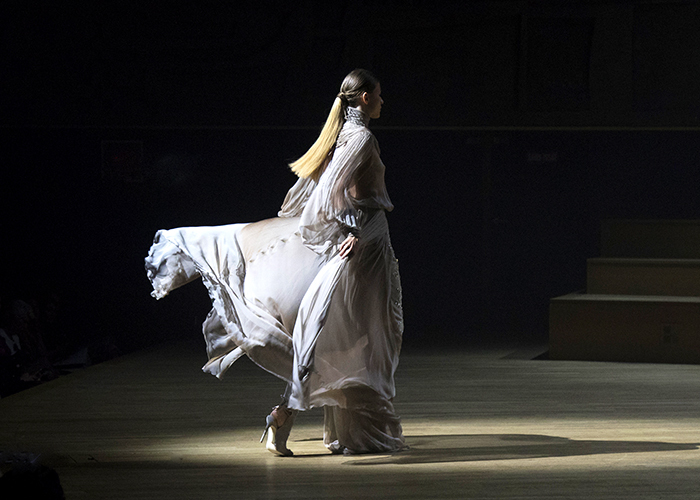 The long silhouettes are emphasised by flowing skirts, swirling at the end of the runway. 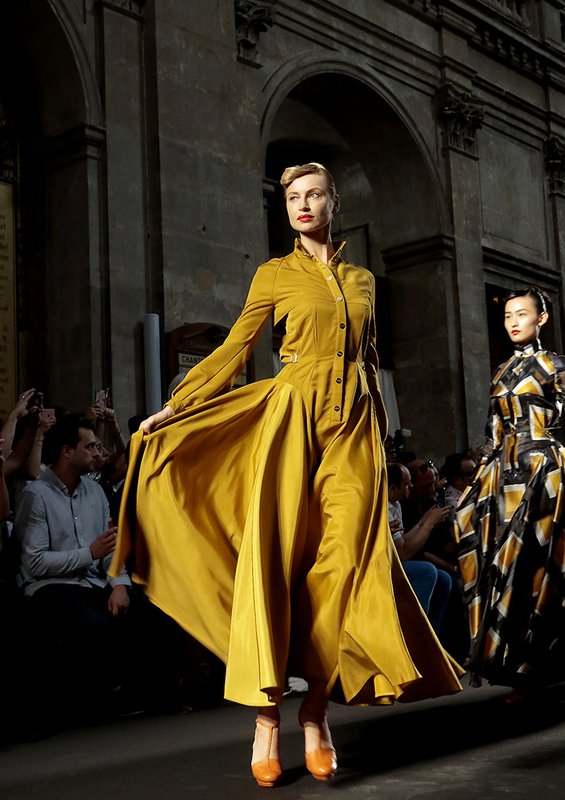 One of the standout designs from the collection is the graphic yellow, white and black gown (see at left) cinched at the waist that follows the shapely form of the woman but is buttoned to the neck with long sleeves. Other highlights of the collection include an ankle-length gown in mustard-yellow with a full skirt (see below) and a glimmering, electric blue evening dress that fluidly clings to the body revealing the form yet concealing the body with a long sleeves and a wonderfully draped skirt (see above). A virtuoso example of the work of Fournié's ateliers is the long, shimmering gown that changes colour from deep reds and purples in a column of sequins overlaid with silk chiffon in burgundy and blue (see in highlights below). 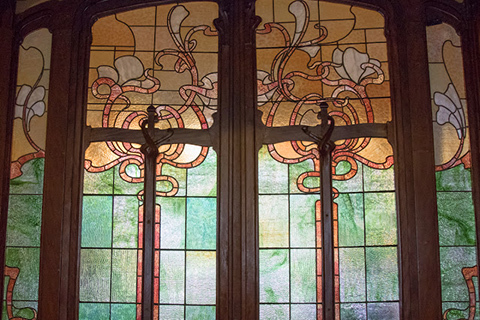 Julien Fournié's family background is directly connected to the making of clothes and accessories, as one set of grandparents were tanners and another made lingerie and corsets. The designer has a Castilian mother and a French father and although growing up he loved to draw, Fournié decided to study medicine and take a degree in Biology once he finished school. However, after two years he changed to study fashion and went on to the Ecole de la Chambre Syndicale de la Couture Parisienne, graduating in 2000. His early promise was evident as he won the Moet & Chandon Prize for best accessories when he graduated. Also during the three years of study and apprenticeship, he worked at famous fashion houses to develop his skills such as at Nina Ricci, Christian Dior and Givenchy haute couture. One of the highlights after Julien Fournié graduated, was working for Jean-Paul Gaultier who employed him as an assistant designer in haute couture for the Autumn Winter 2001/2002 collection and he also had the opportunity to work on the stage costumes for a Madonna tour. Later the young designer gained a lot of experience as the creative director at other brands, including at Paris-based haute couture fashion house Torrente. 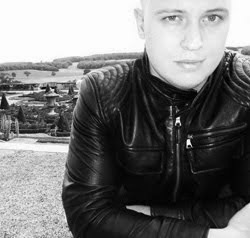 But when he was 32 years old, Mr Fournié founded his own eponymous haute couture company. The designer had always loved the fine workmanship and tailoring of haute couture and the work of the French ateliers that produce and decided that by 2009 he was ready. 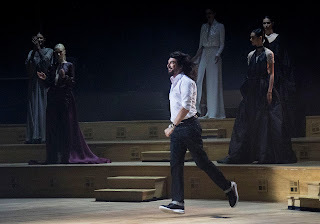 It took only two years for the Chambre Syndicale de la Haute Couture Française ~ the governing body of the French fashion industry ~ to grant Julien Fournié's fashion house guest member status in 2011, which allowed the brand to bear the “Haute Couture” label and participate in the Paris Haute Couture fashion week. 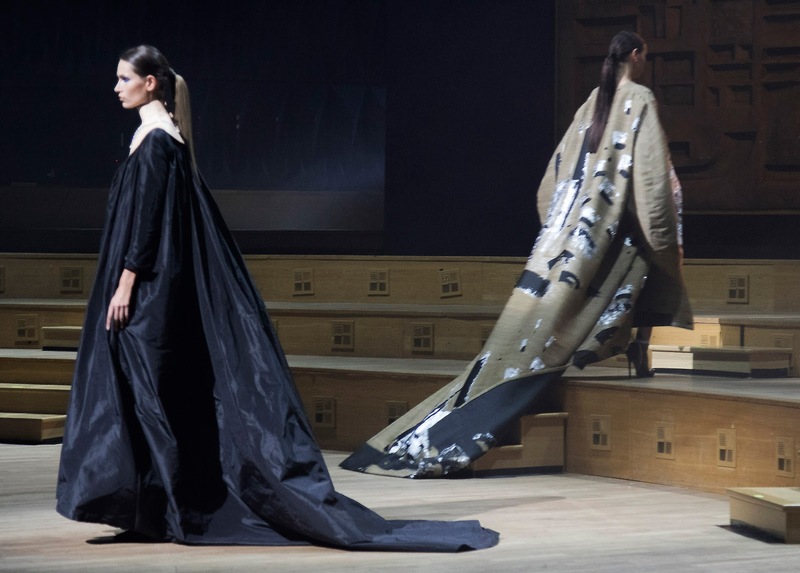 By 2016, the Federation Française de la Chambre Syndicale de la Haute Couture announced that its members had convened on December 16th and elected two new members to the full status of haute couture. One was the storied French house Schiaparelli, which was founded in the 1930s by Elsa Schiaparelli, and the other was Julien Fournié. He is the 15th designer to become a couturier and to have been officially elected as a permanent member like the big houses such as Dior, Chanel and Jean-Paul Gaultier. Julien Fournié first worked at famous fashion houses to develop his skills such as at Nina Ricci, Christian Dior and Givenchy haute couture. 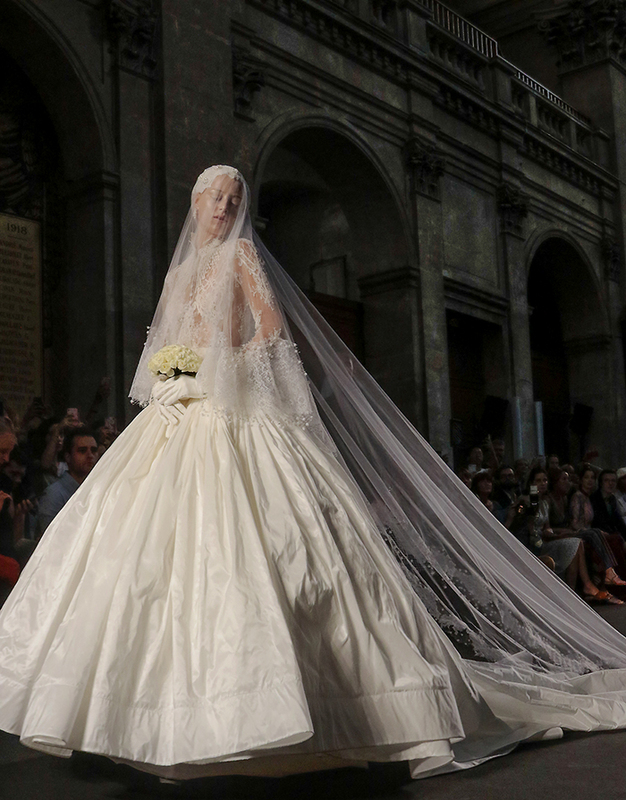 "I'm part of the ninth generation of couturiers, so I have to be the protector of the traditional and handmade savoir-faire of haute couture, namely: embroiderers, feather workers, people who make flowers in an incredible way," the designer said. "But also, I should project the métier into the future. And that’s haute couture, it has to always be three steps ahead. The official name ‘permanent member of Haute Couture’ and the fact that I am one of the 15 worldwide houses that have this label, is going to have crucial repercussions for my business." Julien Fournié is now part of select group of grand couturiers and fashion houses that include: Adeline André, Alexandre Vauthier, Alexis Mabille, Chanel, Christian Dior, Franck Sorbier, Giambattista Valli, Givenchy, Jean-Paul Gaultier, Maison Margiela, Maurizio Galante, Schiaparelli, Stéphane Rolland and Yiqing Yin. This long, shimmering gown changes colour from deep reds and purples in a column of sequins overlaid with silk chiffon in burgundy and blue. The brilliant "anatomical cut" around the body that Julien Fournié is known for, that also combines the lilting flow of a full skirt to the ankles. 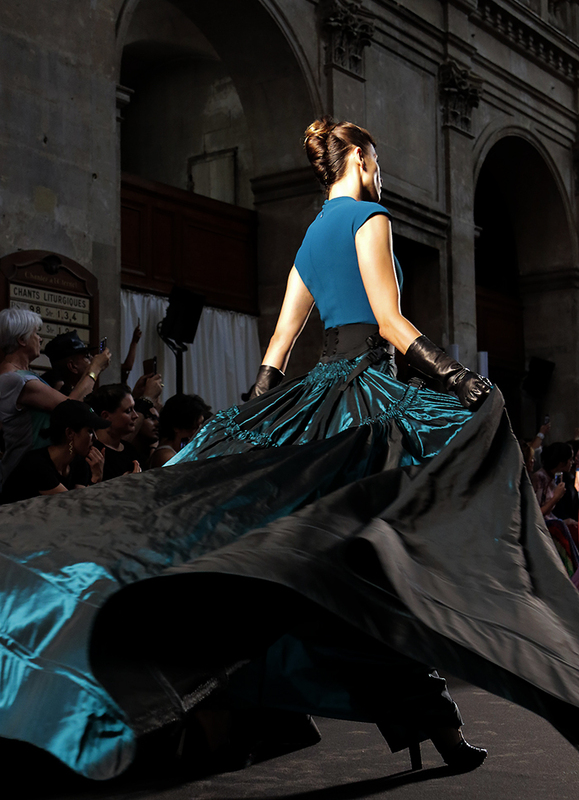 The swing of a brilliant blue skirt at the end of the runway at the atmospheric and historic surrounds of the 17th Century Temple Protestant de L'Oratoire du Louvre in Paris. Like heroines from an Alfred Hitchcock film, played by Grace Kelly, Tippi Hedren or Kim Novak, the models sashayed down the runway. 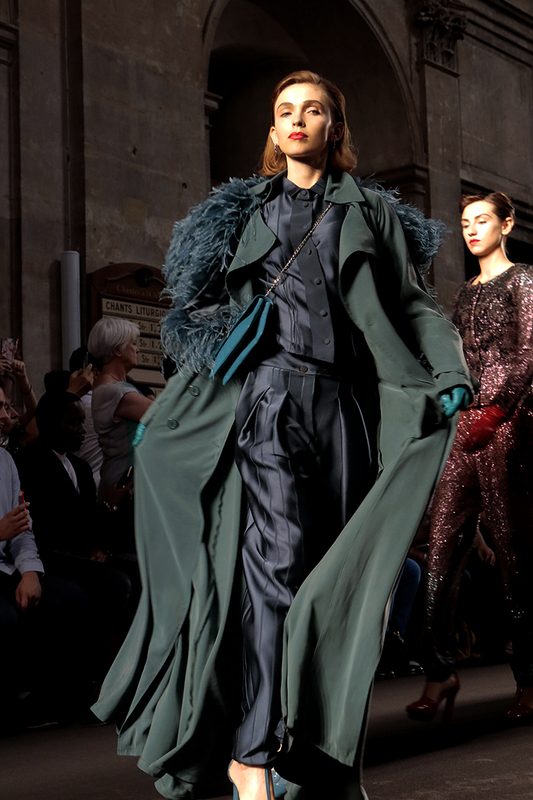 In voluminous blue and green, this pantsuit and long coat have the feeling of a 1950s femme fatale. The spectacular bridal gown with its lace bodice and full skirt recalled Grace Kelly's wedding dress to Prince Rainier in Monaco in 1955. 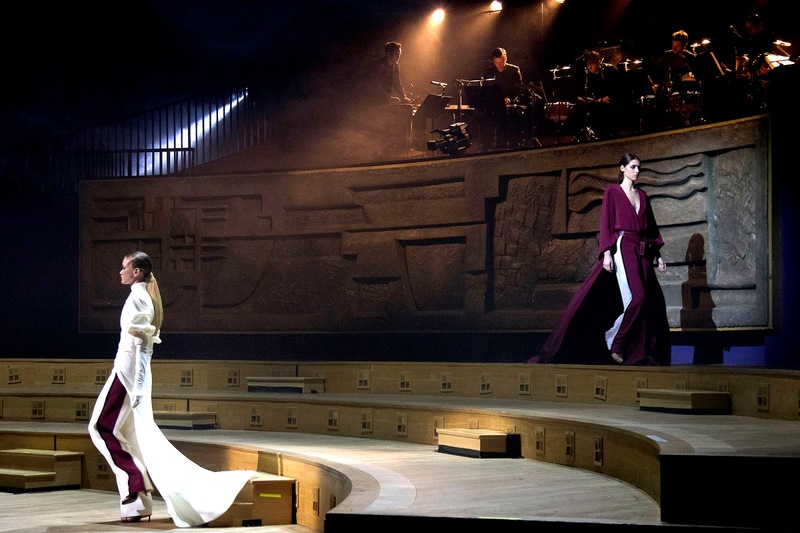 THE rousing sound of six percussionists playing vigorously above the stage created an exciting and lively backdrop to couturier Stéphane Rolland's latest couture collection in Paris. Not for him a nondescript and soulless white runway with models marching down the centre to an electronic beat. 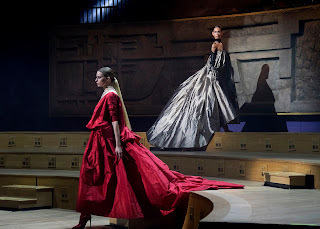 Wearing billowing capes and richly embroidered gowns, models criss-crossed the steps of the famous Studio104 at Radio France, creating beautiful compositions of moving figures in chiaroscuro in time to the music. This Autumn/Winter 2018/19 collection also hinted at spring with feather-light taffeta ballgowns, floating across the stage. "We've worked very hard on this show," Stéphane Rolland says backstage. "There are many different artists involved and it's been so wonderful to put together and collaborate with musicians at the Radio France orchestra, which usually performs all over the world but managed to make itself available." The couturier was inspired by travel from the Silk Road to Europe and the Middle East and the collection has a dramatic play of drapery and volume suggesting billowing capes blowing in the breeze as travellers cross a mountain pass or the dunes of a desert . "I worked a lot on generous volumes," he explains. "You know when you’re in the desert, and you drape yourself, to protect yourself from the heat and cold." Reflecting the travel of another age on horseback he also has tightly-fitting jodhpurs as part of the collection. 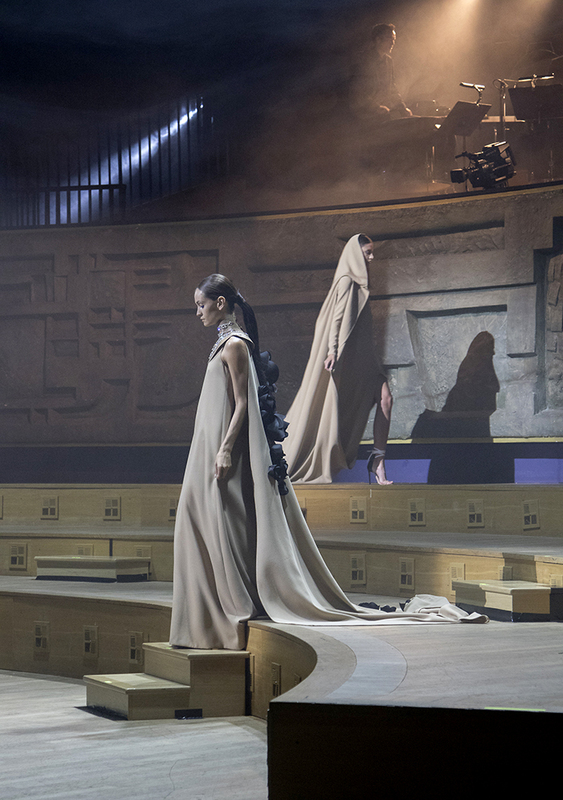 "These were all images in my head, from the Silk Road, from Asia, through Europe, Eastern Europe to the Middle East, and the whole mix, because what this collection tells us is that we are all nomads today." 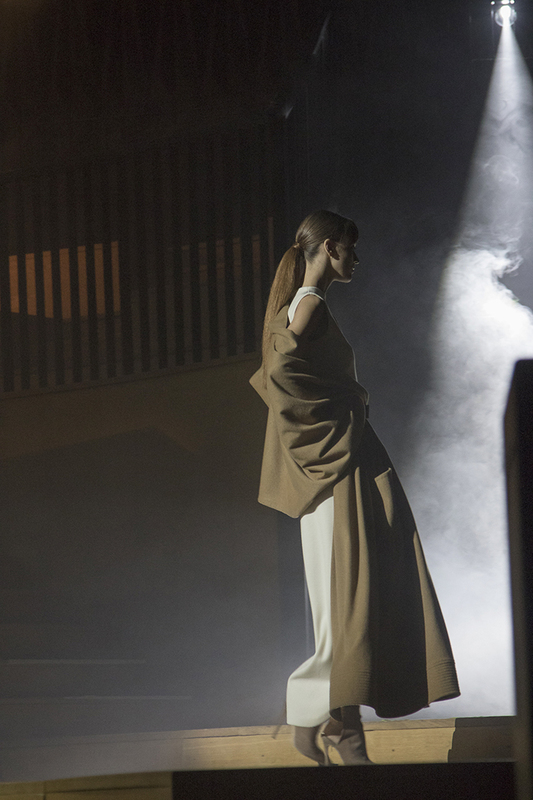 "What this collection tells us is that we are all nomads today"
Wearing a beautifully draped white top and cape with a long, straight skirt the first model emerges from the darkness of the stage to the sounds of the percussionists. To the beat of drums, another appears with a tailored but wonderfully fluid dark suit with wide lapels. Crossing the wooden stairs, with sleek hair pulled back into a long pony tail, a tall girl steps down in a creamy-white column of a dress with a flowing, one-sleeved camel jacket belted at the waist with a neat, boxy bag attached. 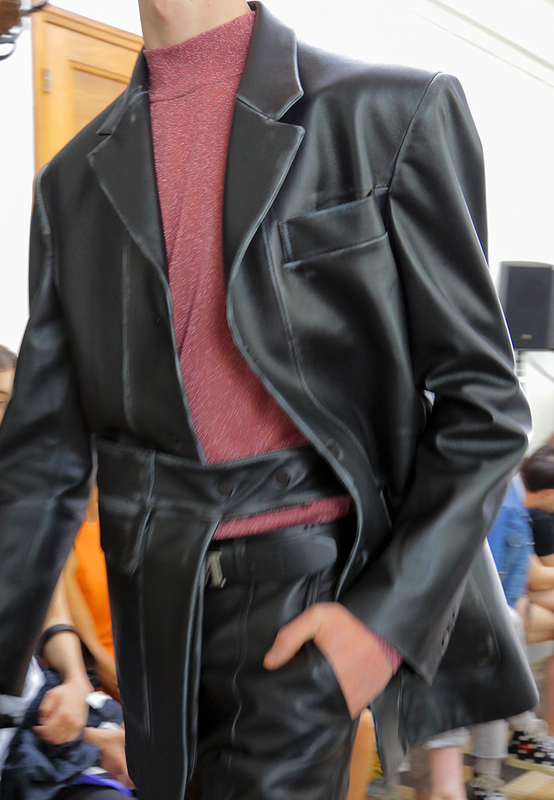 Mr Rolland says he wanted to create a collection that was both wearable and opulent using richly-textured materials. The palette ranges from subtle earthy shades in cream and camel to dark red and gleaming blacks. Fluid, silk pantsuits and graceful jackets are mixed with long coats and slender, embroidered trousers. One of the key accessories was the neat case-clutch made by leather craftsman Philippe Martial worn as a belt and a cuff. The sense of movement and richness in the collection is enhanced by capacious gowns and coats (see at left) in black and white. A floor length yet simple dress is enlivened with sparkling embroidered crystals and a hooded cape fluttering behind. An evening dress in pale sand with a train attached from the shoulders is decorated with silky-black, three-dimensional flowers and a wide collar embellished with glimmering jewels ~ conjuring up the romance of another age yet with a contemporary twist. 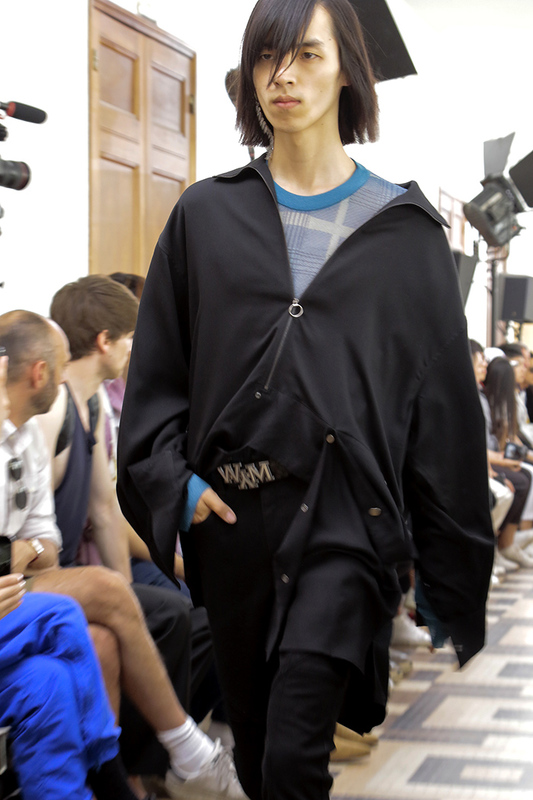 Mr Rolland creates new forms, merging tops, capes, trousers and skirts into one fluent, cohesive design. Loose white trousers are worn with a stylish combined top and coat with puffed and ruched sleeves. 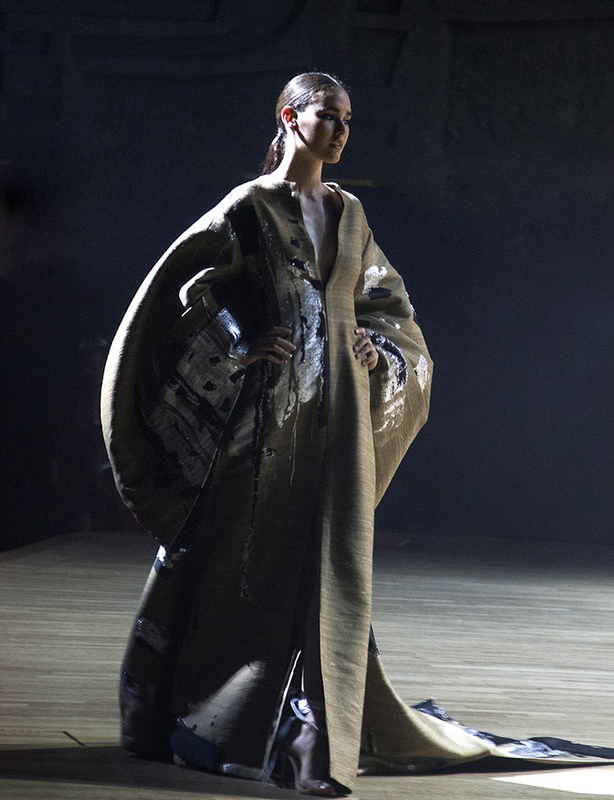 Two of the standouts pieces are a voluminous, tobacco-hued mohair coat with billowing sleeves and high neck embellished with mother of pearl (see below) and a figure-hugging top covered in glinting jewels and draped across one shoulder with a long train. 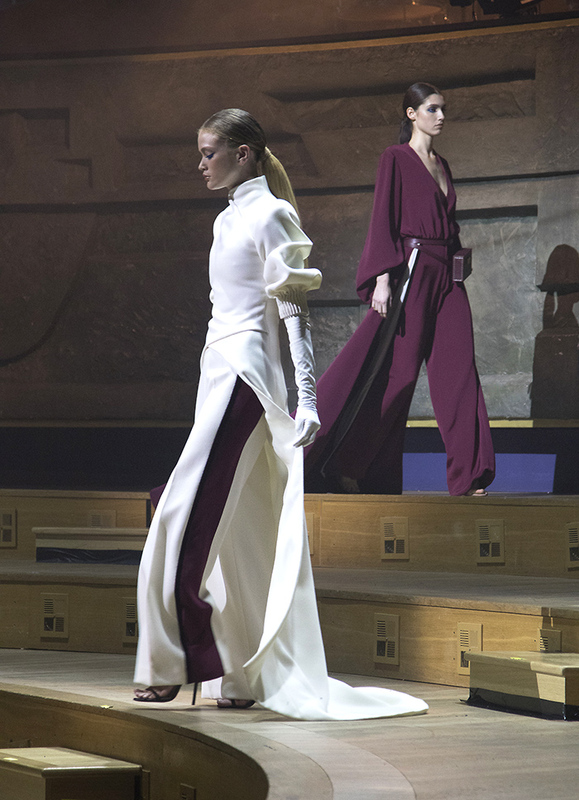 Providing a contrast to the pale, flowing pieces are slim, leather pantsuits with a slit to the navel at the front and a surprisingly low cut back, finished with a silken train (see at left). The designer likes to play with transparency and sculptural forms and this was highlighted by a long, white gown covered in a dynamic, all-over pattern and completed with a floating train. Contrasting with the cream and camel tones of the first pieces to come on to the stage in Paris were a deep burgundy pantsuit and a finely pleated top with large sleeves and a sleek evening gown with long side splits and sparkling embroidery around the shoulders and neck. One of the most evocative creations of Stéphane Rolland's couture collection is a pale grey silk blouse with wide, pleated sleeves and the waist drawn tight with a flowing skirt behind worn with crystal encrusted form-fitting pants (see main picture above). A black coat dress with one sleeve is wonderfully tailored with a contrast of sparkle from long, tight trousers. A silken, black evening gown is enlivened with a transparent front panel and long splits and a jewelled collar and large, fabric flower floating on one shoulder. Mr Rolland's skill as a couturier is exemplified by his creation of new forms, like the black, split skirt worn with a full-sleeved top with wide camel lapels and a cream confection that effortlessly blends cape, sleeve, top and skirt (see at right). 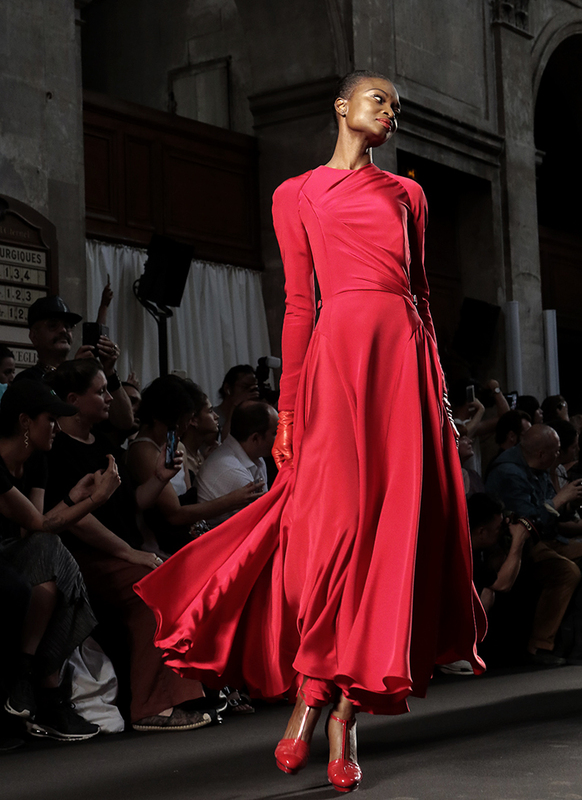 Closing the Paris show were summery sprites emerging from the long chrysalis of winter wearing frothy, translucent ball gowns in taffeta with puffed sleeves (see cover picture). 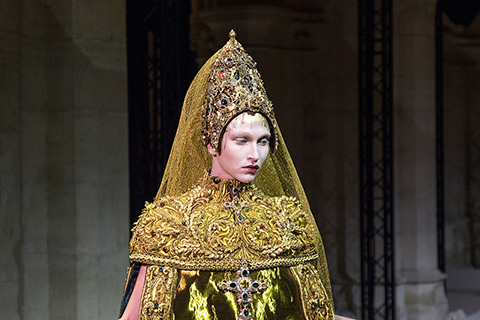 Dotted with glinting crystals, the final gown was completed with a coronet by jeweller Maison Boghossian who collaborates with Stéphane Rolland on his haute couture collections. The artistry of Stéphane Rolland work has been built on a solid foundation. The designer worked at Balenciaga in his early twenties as creative director of menswear and by the time he was 24 years old he had already launched his own prêt-à-porter business. He pursued this for six years before becoming artistic director of a haute couture fashion house for a decade. 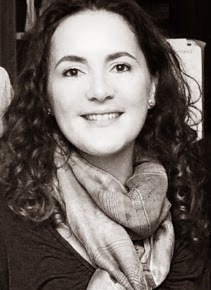 Mr Rolland has also worked as a costume designer and was nominated twice for the prestigious Molière awards. 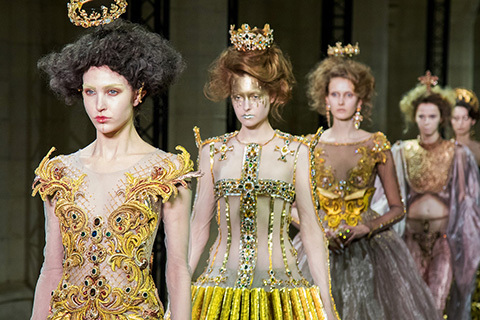 Eleven years ago, he presented his first couture collection under his own name. Today, he is one of only fourteen fashion designers who are full members of the Chambre Syndicale de la Haute Couture in Paris. Closing the Paris show were summery sprites emerging from the long chrysalis of winter wearing frothy, translucent ball gowns in taffeta with puffed sleeves. "We've worked very hard on this show," Stéphane Rolland says backstage. "There are lot of different artists and it's been so wonderful to put together and collaborate with musicians at the Radio France orchestra." Crossing the wooden stairs, with sleek hair pulled back into a long pony tail, a tall girl ascends the wooden stairs in a creamy- white column of a dress with a flowing, one-sleeved camel jacket belted at the waist with a neat, boxy bag attached. An evening dress in pale sand with a train decorated with silky black three-dimensional flowers and a wide collar embellished with glimmering jewels. A floor length, simple gown is enhanced with sparkling embroidered crystals and a hooded cape fluttering behind. On of the standout pieces, a voluminous, tobacco-hued mohair coat with billowing sleeves and high neck embellished with mother of pearl. One of the key accessories was the neat case-clutch made by leather craftsman Philippe Martial worn as a belt and a cuff. "I worked a lot on generous volumes, " the designer explains. "You know when you’re in the desert, and you drape yourself, to protect yourself from the heat and cold." Contrasting with first pieces to come on to the stage in Paris, were fluid pantsuits in deep burgundy and white. 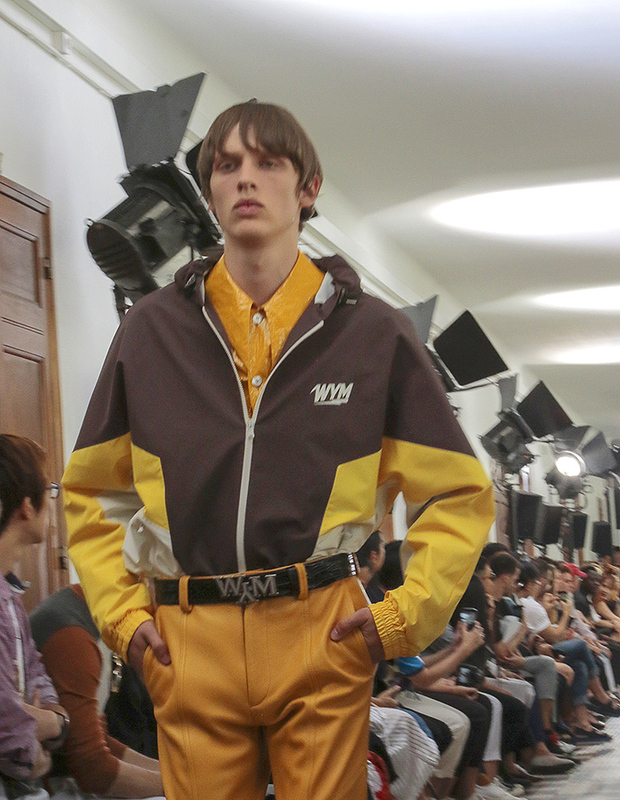 WOOYOUNGMI'S new collection was presented in the cavernous, utilitarian space of a Paris high school with Seventies, geometrically-tiled floors and a wall of large windows flooding the space with light. Located in the French capital's 15th arrondissement, the Lycée Camille-Sée hosted the lively guests on long, low benches in the high-ceilinged room. The designer says she would like the young generation to appreciate the British singer and fashion iconoclast and see his creative legacy explored and reinterpreted. Chung says she wants to present a new version of Bowie, one that inspired her growing up in Seoul. For this latest collection, she didn't want her designs to replicate Bowie's look but rather his sense of style. Her aim is to create a romantic bohemian aesthetic exploring Bowie's gender ambiguity and his play on masculinity and femininity, just as the singer did during his various fashion metamorphoses. Chung was particularly drawn to Bowie's coolly elegant tailored Eighties looks that he wore after his earlier, more dramatic stage personae and this is reflected in her range of suits. She has designed the collection using a range of different textiles from checked and pinstriped suits to glimmering knitwear and shirts with a metallic sheen. A luminescent fabric emphasises the more high-tech futuristic approach. Yet the collection also looks back to the power-shoulder, a motif that runs through the collection along with big, deeply pointed collars. 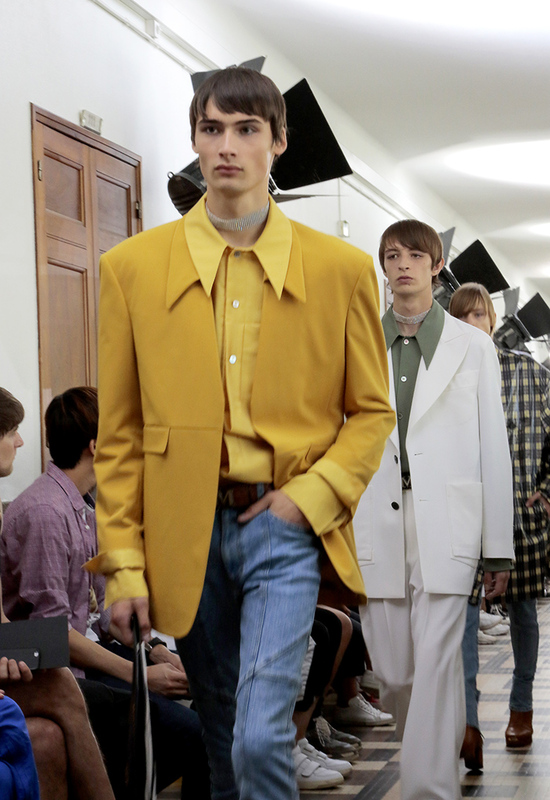 There is even a matching yellow jacket and shirt (see at right) that echoes a 1974 Terry O’Neill portrait of David Bowie. A zing of glam rock heightens the Bowie connection with Chung's use of PVC for check print or peach jackets and shirts worn with denim and leather pants, the gender ambiguity highlighted by glittering diamanté chokers, round handbags and high-heeled, chunky ankle boots. Although mixing streetwear and tailoring is a leitmotif of contemporary menswear, the designer has given it her own signature with its volume, fluidity and combination of soft and hard textures. 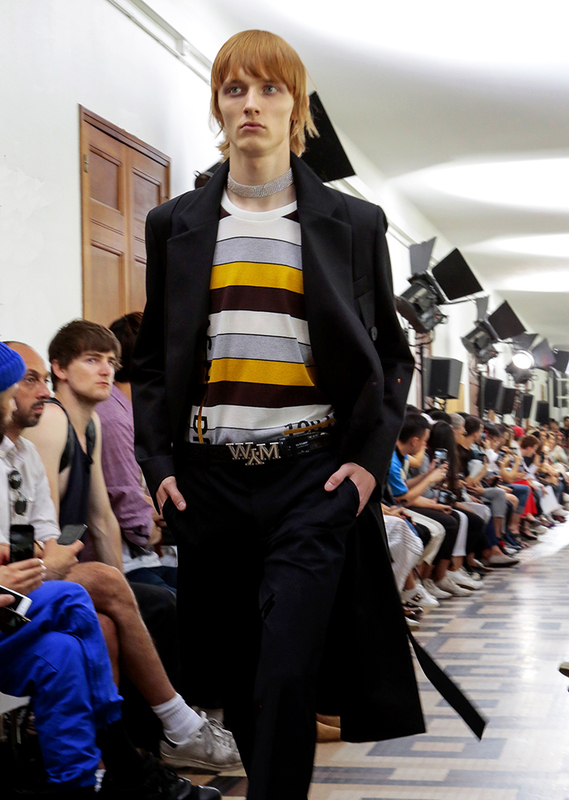 One of Chung's new additions is the use of the brand's logo WYM that appears on this season's suits, t-shirts and belts. 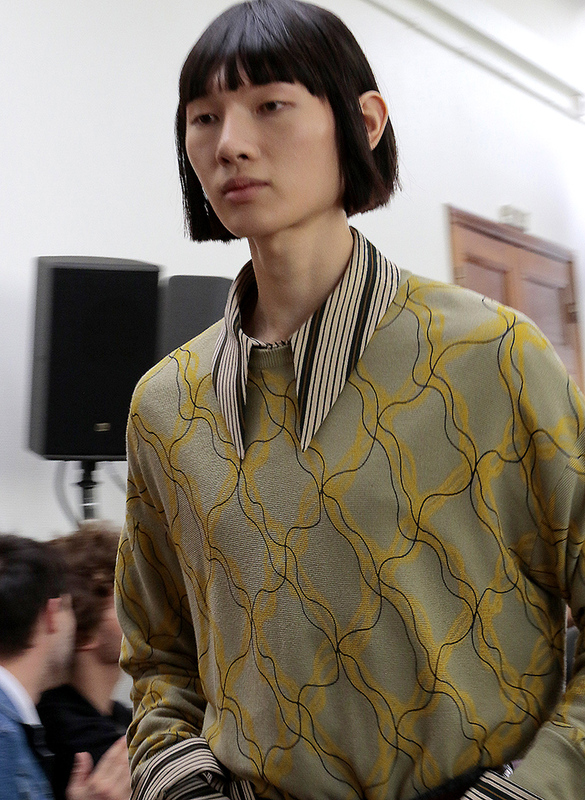 Katie Chung succeeded her mother at last season's menswear collection after having worked beside her as co-creative director. Chung has said in the past of her childhood that she grew up in her mother's atelier and that she learnt to sew before she could write. Today, although Madame Woo is still close by and supports her daughter, Katie Chung has confidently taken the reins of Wooyoungmi and is giving it a evocative edge of street style and sportswear that builds on her mother's pioneering legacy as a Korean designer breaking into the Parisian fashion world. Madame Woo, as she became known, was born in Seoul to an architect and an art and piano teacher. Her father was the head of an architectural firm and travelled overseas extensively, bringing back international magazines which gave Woo Youngmi a sense of the world outside South Korea. The young Woo became interested in fashion at a time when the country was struggling with post-war political unrest. In 1978, she began her fashion studies at Seoul's Sung Kyun Kwan University. After she graduated in 1983, she was named the winner of the Osaka International Fashion Award, when she was selected to represent Korea. 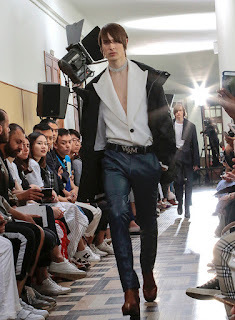 Later Woo Youngmi launched the menswear brand Solid Homme in 1988, starting with one showroom in Seoul before branching out all over the world. Along with other designer friends, she started the New Wave in the early Nineties, as a platform for young designers to show their work which eventually lead to the creation of Seoul Fashion Week. The designer founded and launched her own brand Wooyoungmi in 2002 in Paris. The label became known for its art and architecture inspirations and finely tailored menswear with a futuristic edge. Woo Youngmi was showing on the Paris Menswear Week by 2003 and eight years later, the label became an official member of La Chambre Syndicale de la Mode Masculine. 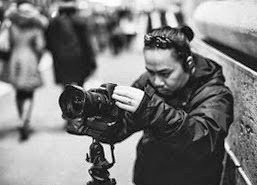 Katie Chung became more involved with her mother's fashion house in 2012 as art director, collaborating with artists for their advertising campaigns. 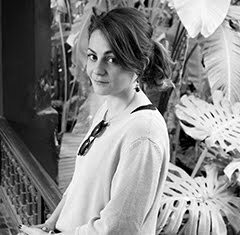 She became joint creative director of the brand with her mother in 2014 later after completing a BA at London’s Central Saint Martins, before taking over the artistic direction of the brand last year. Katie Chung succeeded her mother at last season's Wooyongmi menswear collection after having worked beside her as co-creative director. 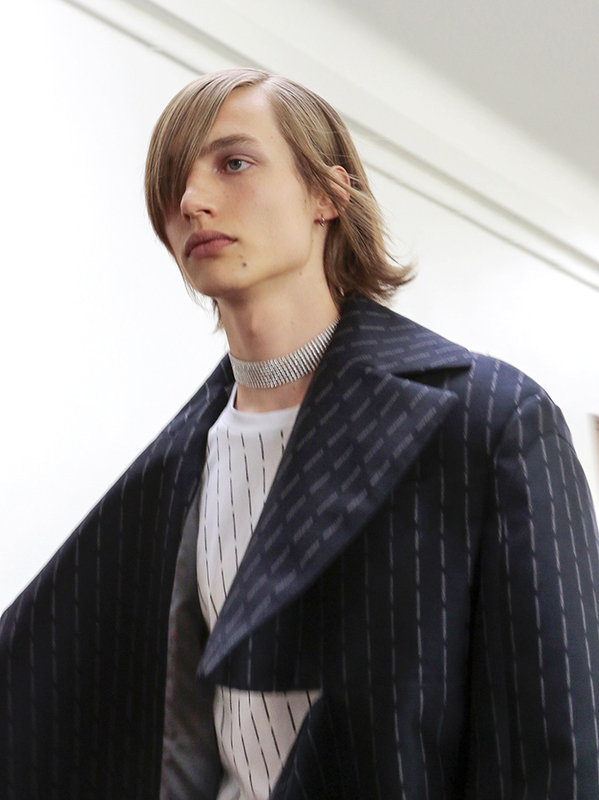 Mixing streetwear and tailoring is a leitmotif of contemporary menswear, but Katie Chung has given it her own signature with its volume, fluidity and combination of soft and hard textures. 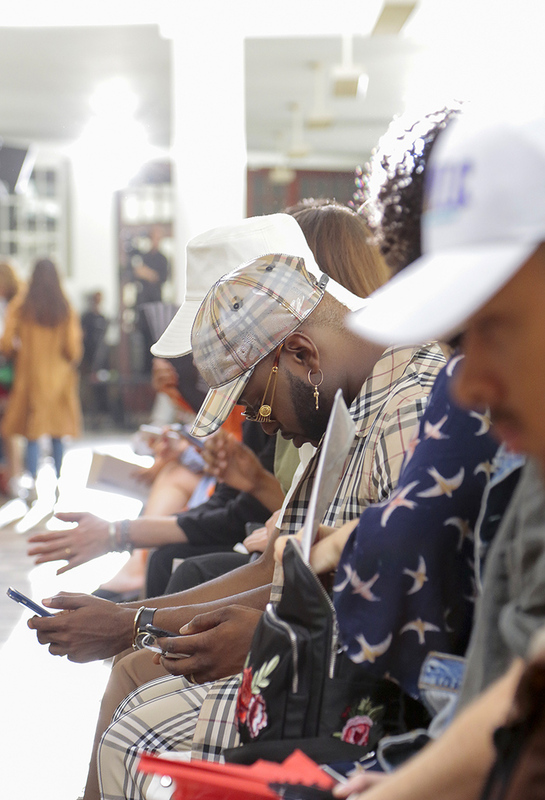 Guests in the front row at Wooyoungmi SS19, the show was located in the French capital's 15th arrondissement, at the Lycée Camille-Sée. Katie Chung's aim with the new collection was to create a romantic bohemian aesthetic exploring David Bowie's gender ambiguity and his play on masculinity and femininity. Models wore some of the favourite Seventies hues: yellows and browns in stripes and blocks of colour. 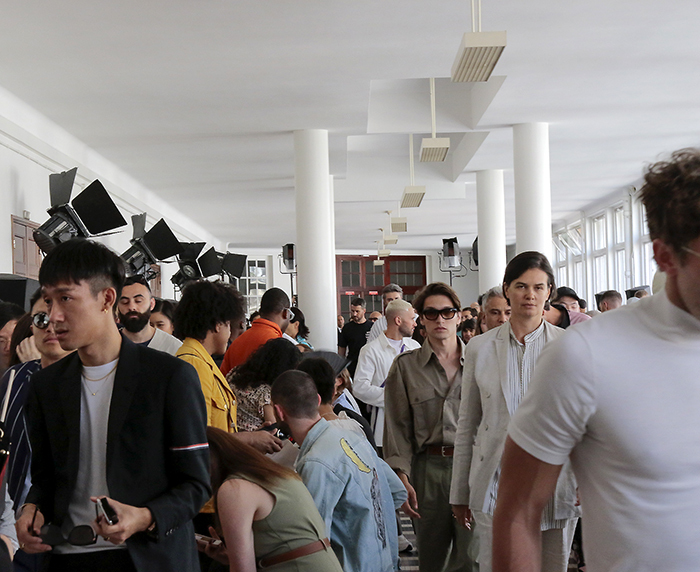 Guests at the of Wooyoungmi SS19 show held in the cavernous, utilitarian space of a Paris high school. 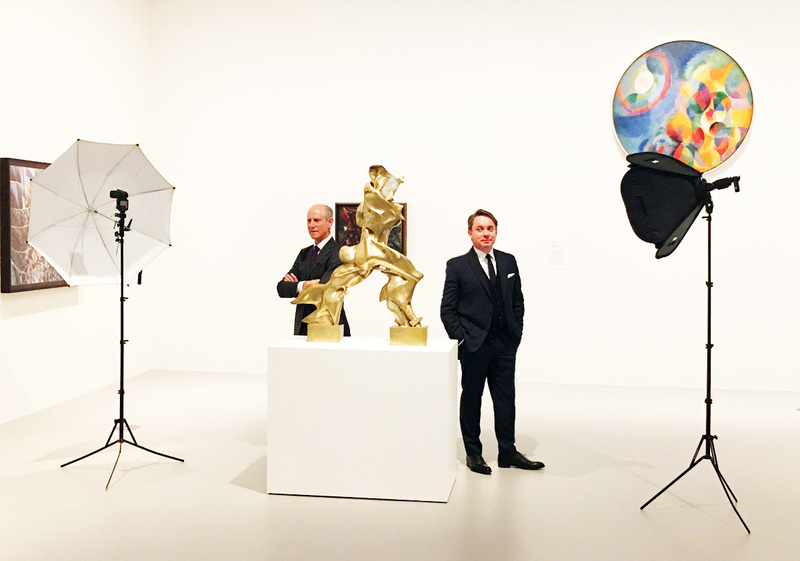 Glenn D. Lowry and Tony Ellwood with Umberto Boccioni's bronze sculpture Unique Forms of Continuity in Space. 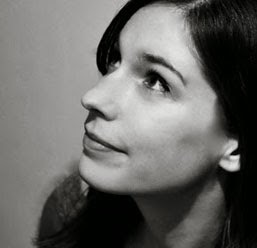 Portraits for DAM by Paul James McDonnell. 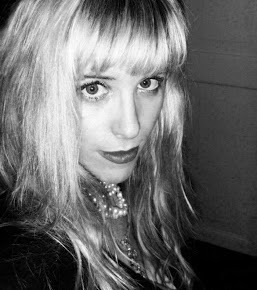 See below for Jeanne-Marie Cilento's video interview. 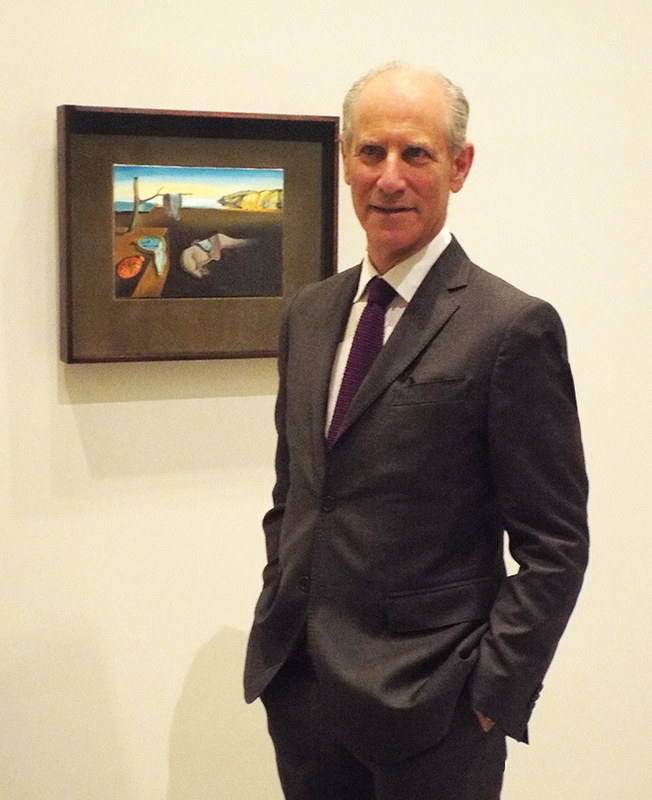 DAPPER and erudite, Glenn D. Lowry, the director of New York's Museum of Modern Art, stops in front of Salvador Dali’s totemic 1931 painting, The Persistence of Memory. 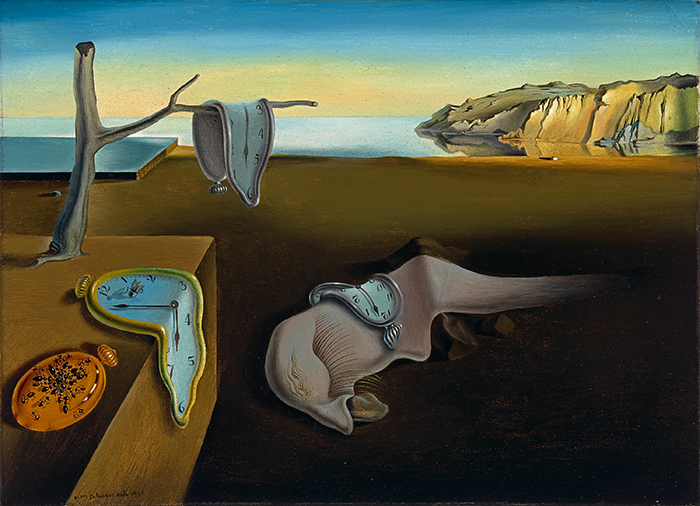 Dali, he explains at the National Gallery of Victoria, painted the image at a time of social change and scientific discovery, just after Einstein’s theory of relativity. “It packs such enormous punch in such a small package,” he says. 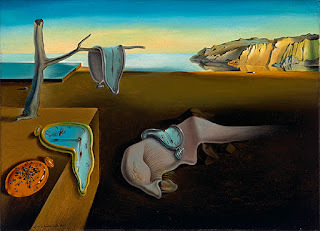 “Its intensity, its magic is derived by its scale and its impression of space - that time is warped.” With its melting distorted clocks, it is Dali’s way of commenting on the intersection of time and space. Lowry is in Melbourne for the world premiere of the exhibition, MoMA at NGV: 130 Years of Modern and Contemporary Art, which has opened at the National Gallery of Victoria (NGV) and will run until October, 2018. 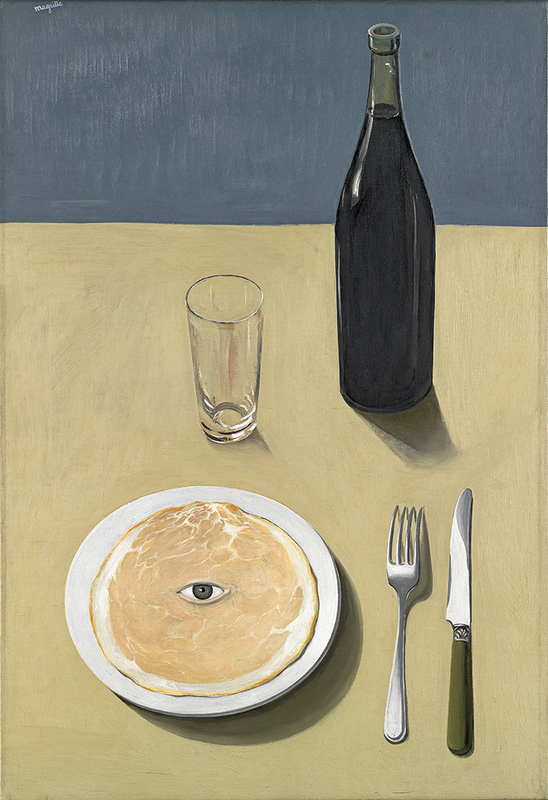 This is only the second time the Dali has been lent to an international gallery. Its presence signals the importance that the Museum of Modern Art (MoMA) gives to this exhibition, which hosts many works never before seen in Australia. In a coup for the NGV, more than 230 hand-picked masterpieces are now installed as part of its 2018 Winter Masterpieces series. 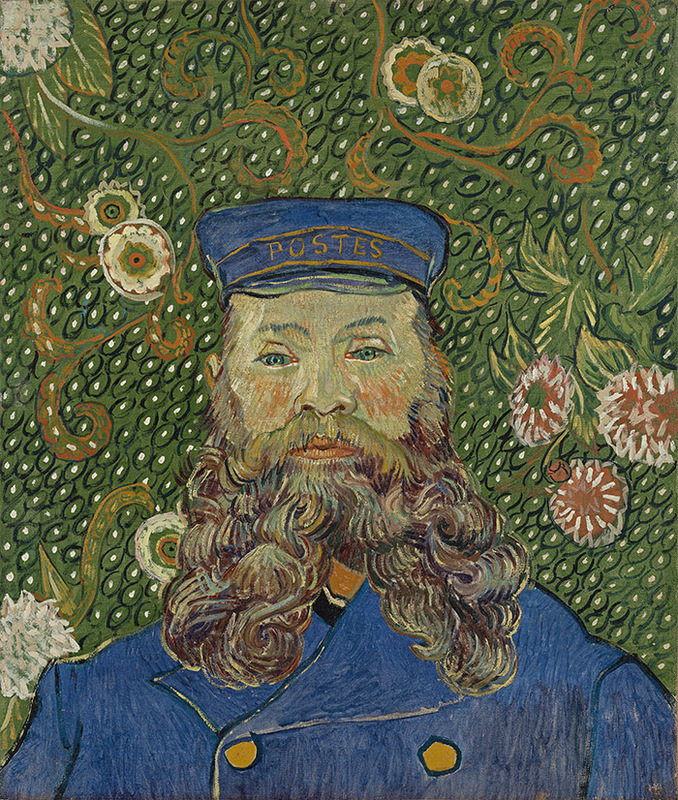 The series is a fifteen-year project that began in 2004; past shows have included The Hermitage, Degas and Van Gogh and the Seasons. This is a reference to the way the MoMA and NGV curatorial teams worked together on the exhibition. “Watching how they have changed this exhibition as it evolved, that’s an enormous thrill if you like this notion that art should create relationships and conversations, whether it’s between a work of art and the general public, or between curators and institutions,” says Lowry. “So it’s been really rewarding to see that happen.” As Lowry and Ellwood walk through the show, their excitement and pride are palpable. “It was amazing to walk through the exhibition and realise...we loaned them that!” says Lowry of the collection, which comprises some of MoMA’s best and most well-loved pieces. 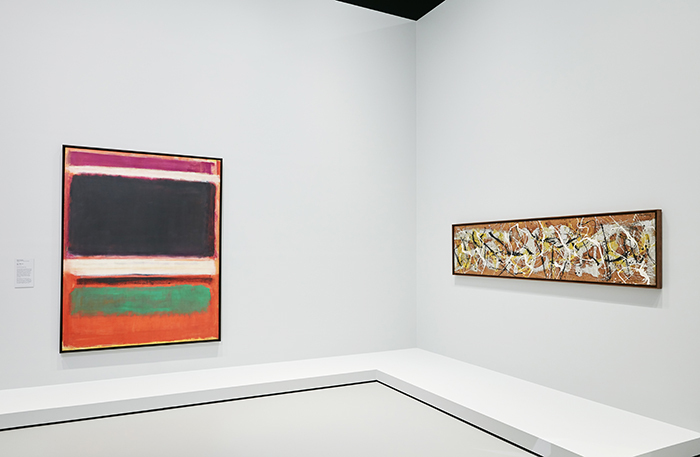 The works on display in Melbourne span 130 years, covering the significant art movements from Cubism, Surrealism and the Bauhaus, to Abstract Expressionism, Pop Art and contemporary art. 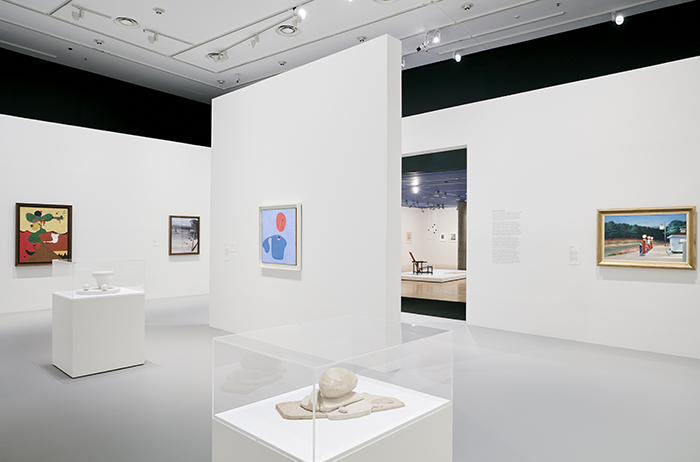 The exhibition includes pieces from MoMA’s six curatorial departments: architecture and design, drawing and prints, film, media and performance art, painting, sculpture and photography. It showcases the museums multi-disciplinary approach to collecting, with notable examples of design, lighting, furniture and technological innovation. 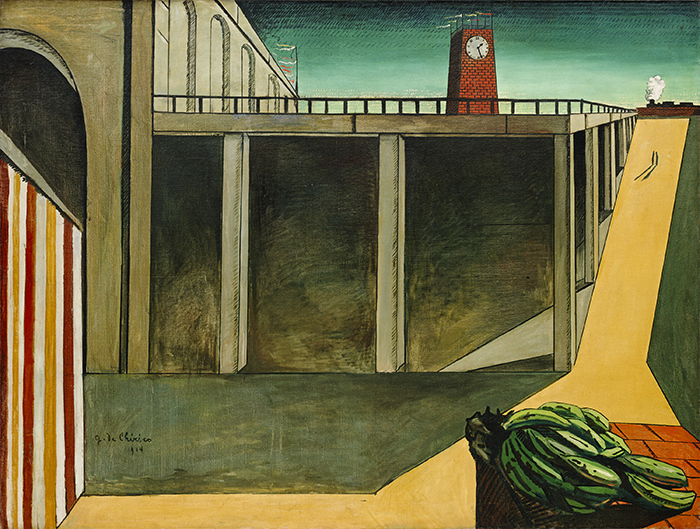 Choosing the works to display was a joint decision involving Lowry and Ellwood, and curators from both museums. 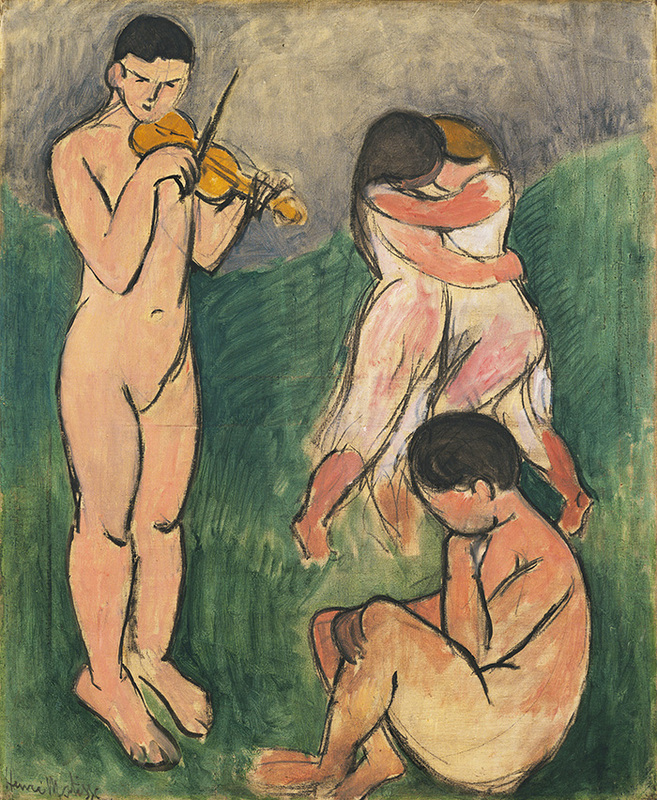 The sprawling collection, which takes up the entire ground floor of the NGV International, begins in the early twentieth century with the European masters who kick-started the New York museum's original collection in 1929. Called Arcadia and Metropolis, it contains the DNA of MoMA, the foundation on which it is built. 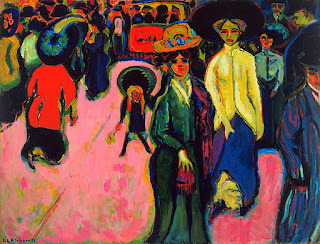 Significant works from artists of the nineteenth and twentieth century are represented here: Pablo Picasso, Paul Gauguin, Henri Matisse, Paul Cezanne, Vincent Van Gogh and Georges-Pierre Seurat whose delicate pointillist work, Evening, Honfleur, is as magnetic and contemporary today as when it was painted in 1886. This marriage of art and design reflects MoMA’s early striving to find the linkages between industrialisation and the high arts. 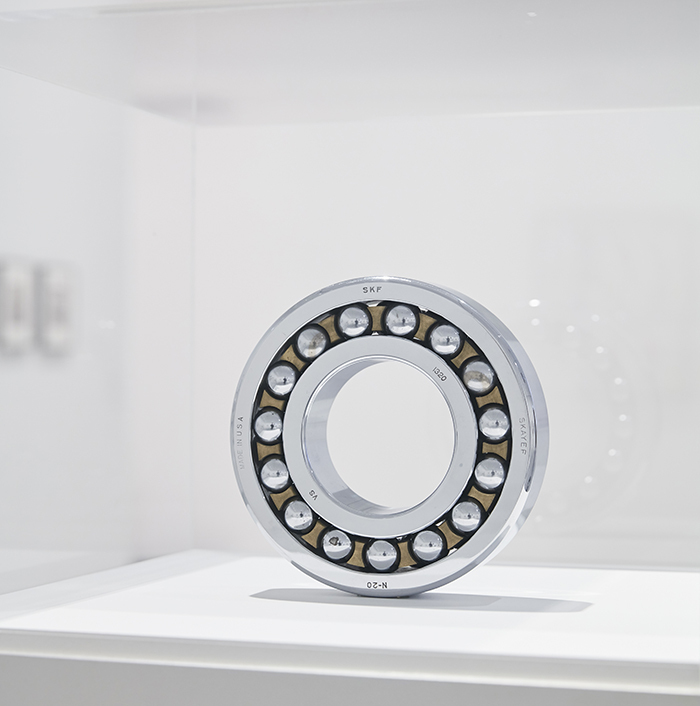 Echoing MoMA’s radical homage to industrial design, the Machine Art exhibition of 1934, the NGV collection features design wonders from the twentieth century. Sven Wingquist’s Self-Aligning Ball Bearing from 1907, is an exemplar of its time and here it is: rounds within rounds, sleekly elegant, still modern (see below). 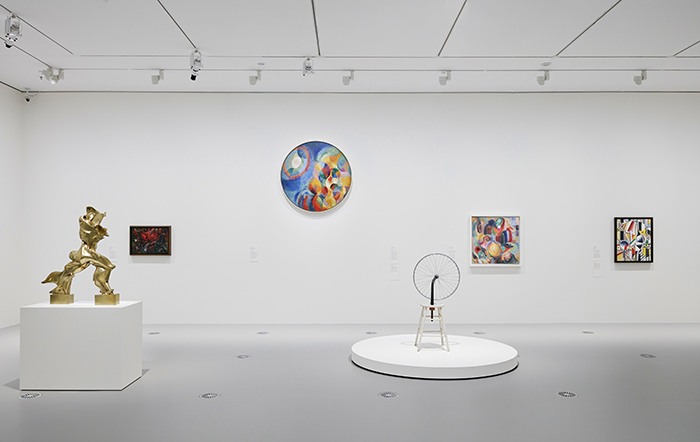 In the same room, Marcel Duchamp’s Bicycle Wheel from 1913 (see images in gallery below) subversively marries functional objects, a stool and bicycle wheel, to create one of the first examples of conceptual art. With its lens on the latter part of the century, Flight Patterns shows the effect of increased physical mobility and the impact of the emerging digital age. Solari di Undine’s Split flap board flight information display system from 1996, evocatively captures, both visibly and audibly, the experience of travellers in the pre-digital age. 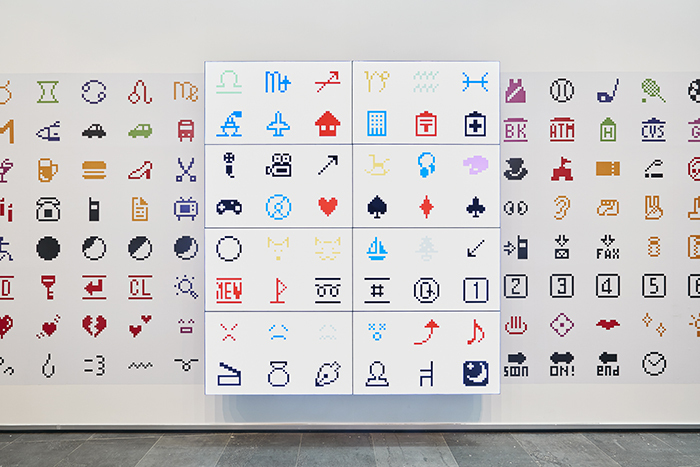 The 1998-99 work, Emoji, by Shigetake Kurita et al (see below), with its familiar assembly of keyboard characters and symbols, heralds the typography of the digital design era. The exhibition is a vivid reminder of the impact of social and cultural change on design across decades, and its convergence with contemporary art. “MoMA is very thoughtful about providing the kind of diversity and balance, both culturally, through gender where possible - all the key elements,” says Ellwood. 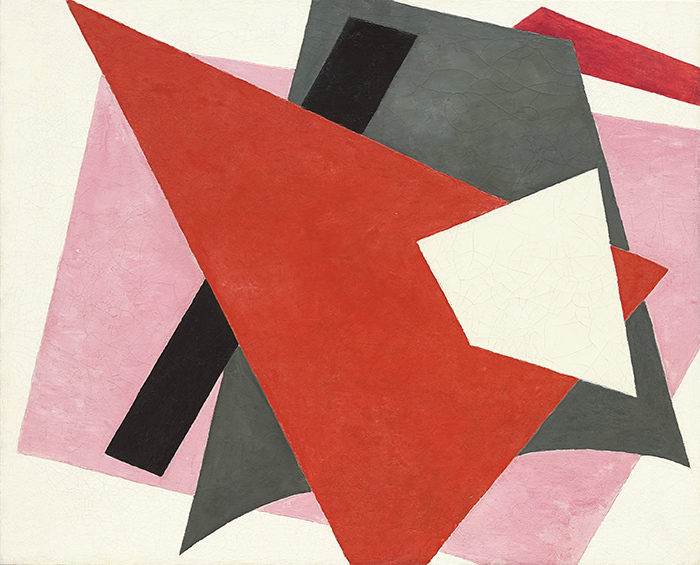 Early Modernism, De Stijl and the Bauhaus movements in revolutionary Russia, the Netherlands and Germany are explored in The New Unity section. From film to painting to costume design, this era had a global influence. Artists such as Torres-Garcia and Mondrian travelled, forging relationships and connections with other artists, spreading ideas about what modern art meant - visually and in terms of social change. Here, Mondrian’s Composition in Red, Blue and Yellow, and Gerritt Rietveld’s The Red and Blue Chair, are perfectly simpatico (see picture below). 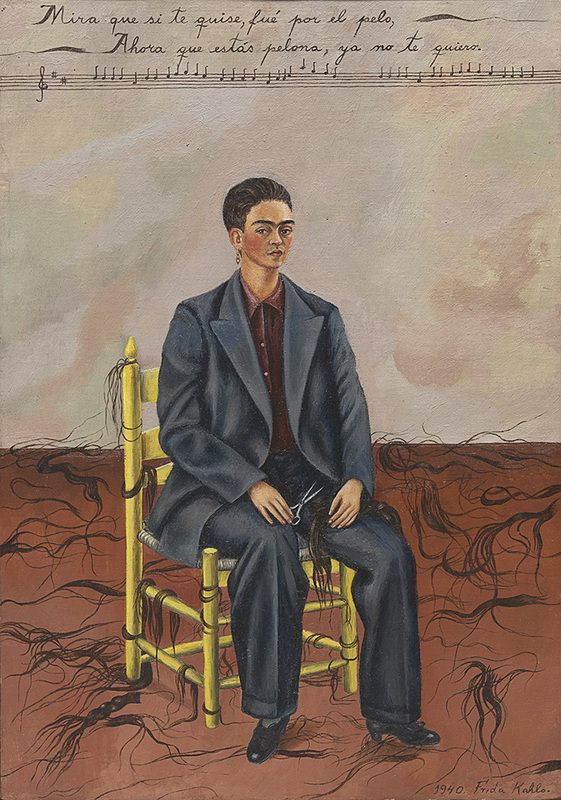 In its consideration of Surrealism, the section of the exhibition called Inner and Outer Worlds includes the works of Joan Miro, Rene Magritte and Frida Kahlo’s compelling 1940 work Self-Portrait with Cropped Hair. The portrait of Kahlo with her long hair shorn, dressed in a man’s suit, is a comment on beauty as a commodity. It gives an insight into Kahlo’s perception of her own beauty and her position as a female artist at the time. Seventy years later, the image is powerful and the message still resonates. Here, too, are American masters: Edward Hopper’s Gas from 1940 profoundly captures the quotidian life of mid-century America. 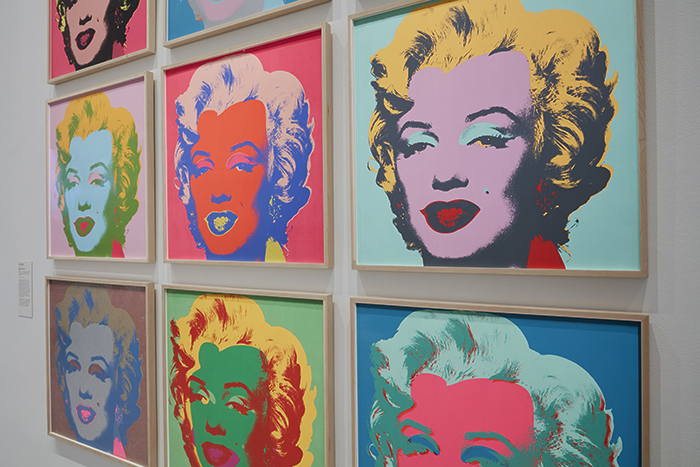 Iconic pieces are everywhere, instantly recognisable. Not just art, but furniture and everyday design. 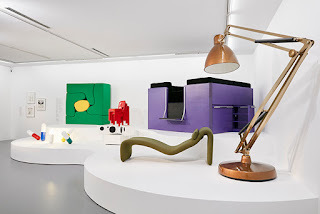 In the part entitled Things As They Are, the metallic architectural lines of an oversized Moloch Floor Lamp by Gaetano Pesce from 1971 (see above), contrast with the soft curves and green-and-yellow fabric of the wall-mounted Malitte Lounge Furniture, designed by Roberto Matta in 1966. 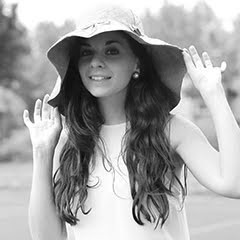 It’s a fun and head-spinning trip back to the sixties and seventies. 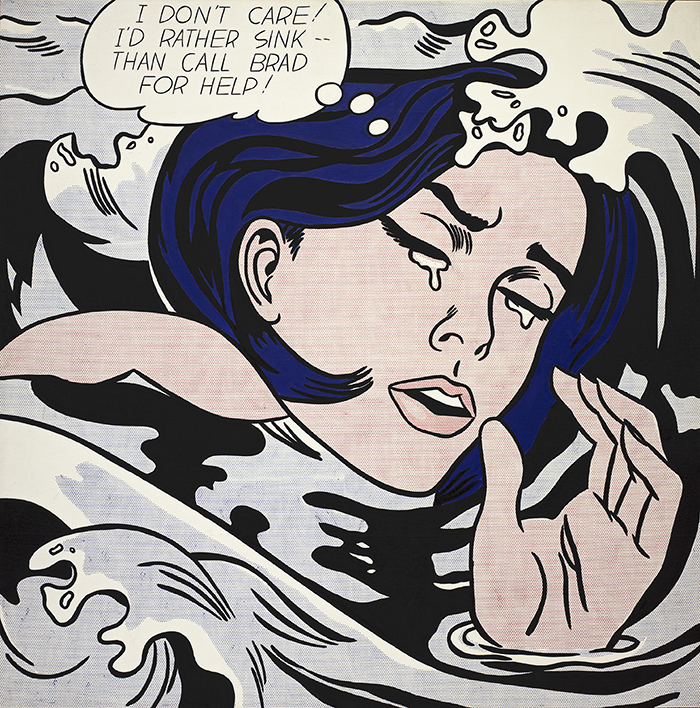 The emblematic Drowning Girl, painted by Roy Lichtenstein in 1963, has been selected as the exhibition’s Pop Art calling card, with it's dramatic cartoonish image and caption, seemingly printed but all painted by hand. 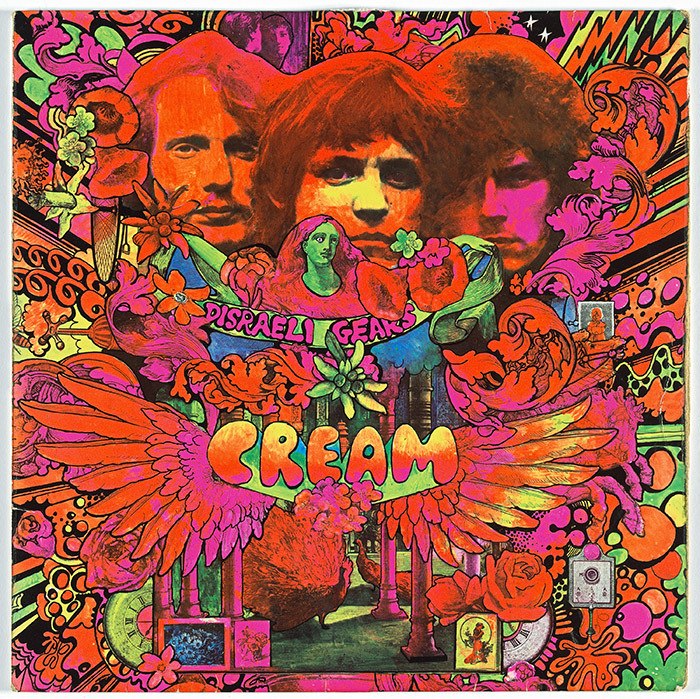 An Australian connection is also on display: the work of Sydney-born artist Martin Sharp, whose psychedelic poster design for sixties rock band Cream became the album cover for Disraeli Gears, completely captures the zeitgeist of the decade (see below). 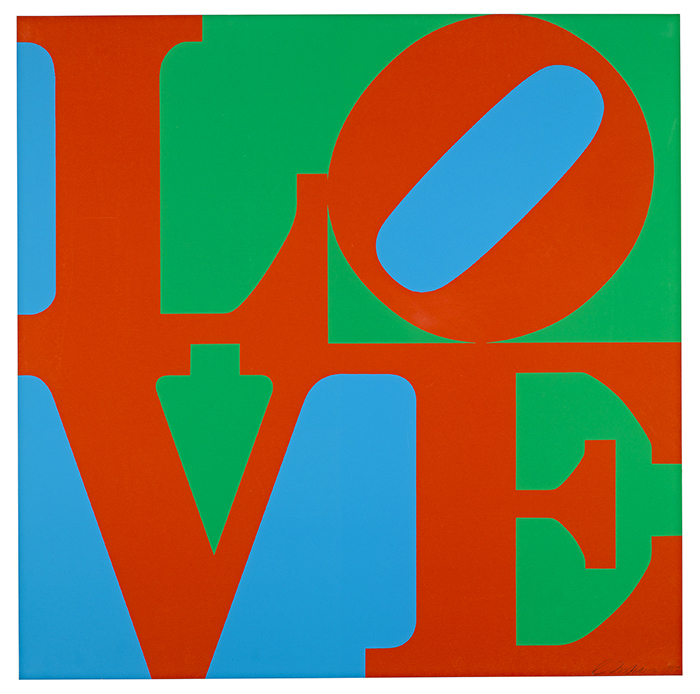 Robert Indiana’s LOVE, with its stencilled font, is here too; an indelible reminder of the freedom of the sixties. Moving through rooms and themes, Immense Encyclopedia shows the influence of social and political change as art moves into the postmodern age. The art collective General Idea’s memorable AIDS (Wallpaper) from 1988, inspired by Indiana’s earlier work LOVE, replaces the familiar letters LOVE with AIDS. It is a reminder of the upheaval it wrought in that decade. 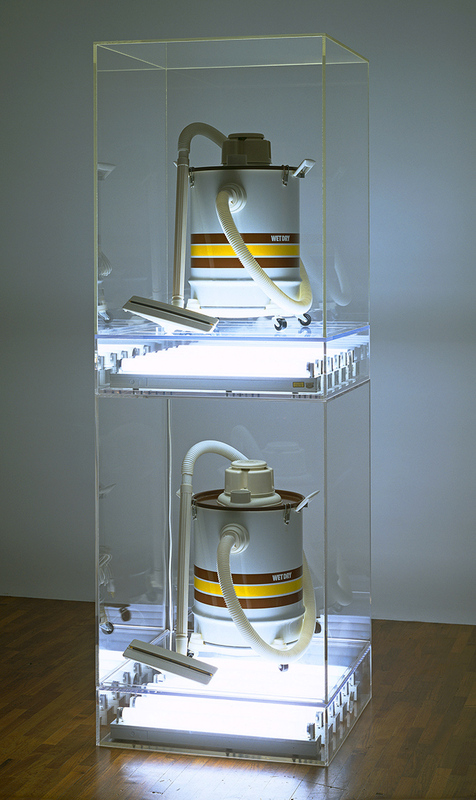 Elsewhere, Jeff Koons’s Plexiglas-enclosed vacuum cleaners are like Postmodern sculptures called New Shelton Wet/Dry Doubledecker, they make us question the nature of contemporary art. Accompanying Lowry at the opening of the exhibition were members of the MoMA team including curators Juliet Kinchin and Christian Rattemeyer; Ramona Bannayan, Deputy Director of Exhibitions and Collections; and Jay Levenson, Director of MoMA’s International Program. 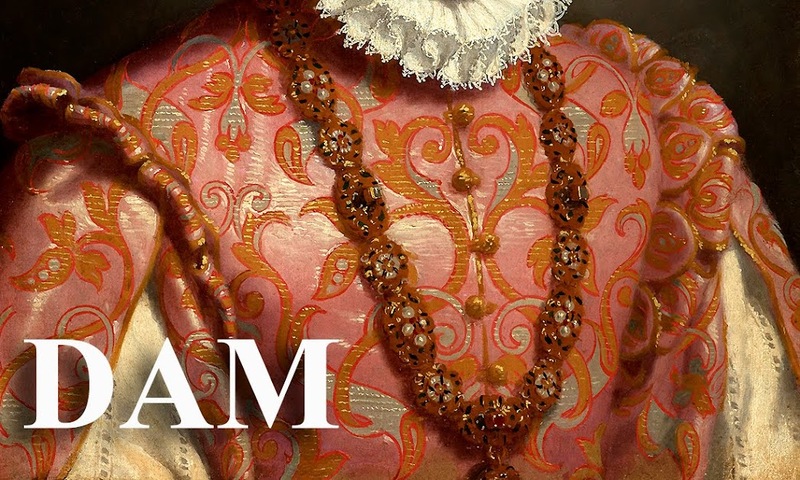 They worked with key staff at the NGV, including Dr Miranda Wallace, senior curator of international collections, and exhibition designer, Ingrid Rhule, to curate the milestone collection. The deft showcasing of such works as Gauguin’s masterful The Moon and the Earth, Andy Warhol’s seminal Marilyn Monroe, and Camille Henrot’s filmic Grosse Fatigue is to witness MoMA’s prescience in tracking art and design over 130 years. 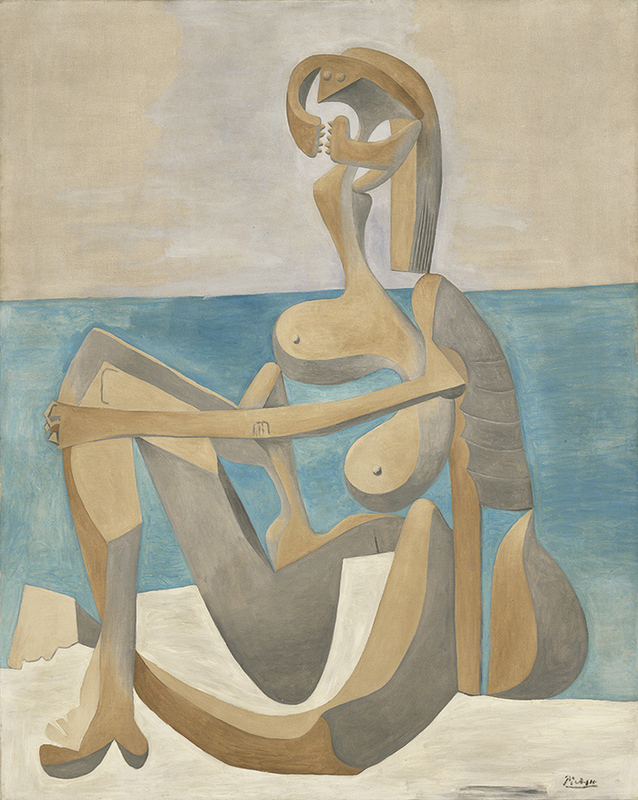 "This ability to imagine new futures and move in new directions guides MoMA today and is embodied in the NGV works"
Discussing MoMA’s legacy, Lowry describes its founders and early curators as visionaries who believed that the visual arts cut across all domains. “They saw the museum as being metabolic and self-renewing, a place of change, not stasis,” he explains. "This ability to imagine new futures and move in new directions guides MoMA today and is embodied in the NGV works." MoMA at NGV: 130 Years of Modern and Contemporary Art at the National Gallery of Victoria from 9th June to 7th October, 2018. 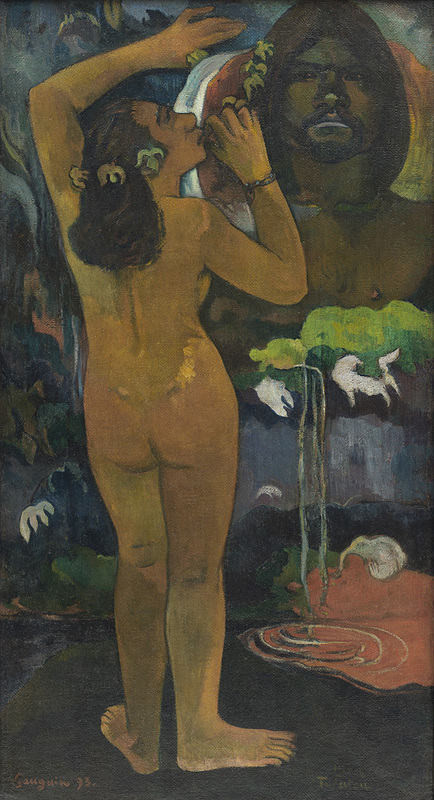 Paul Gauguin (French 1848–1903) The Moon and the Earth (1893) oil on burlap. 114.3 x 62.2 cm. 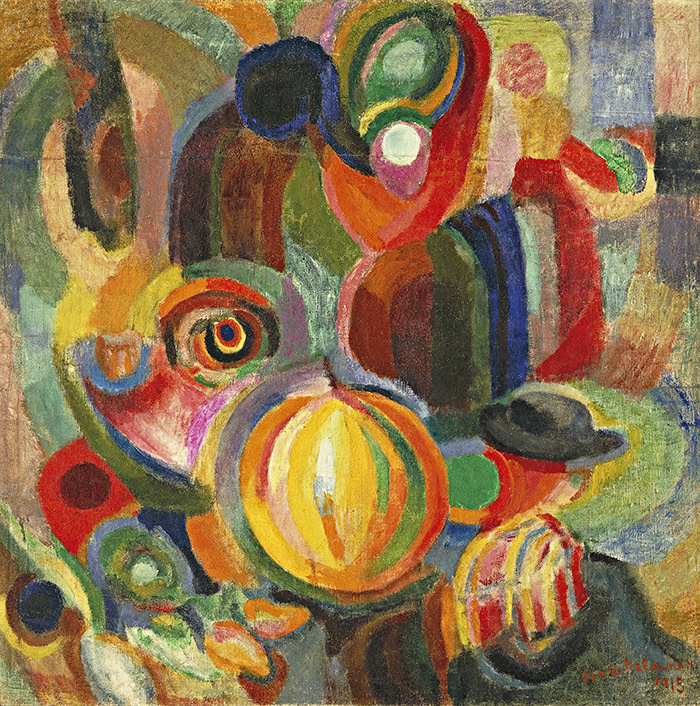 Pictured at the NGV, works by Umberto Boccioni, Marcel Duchamp, Robert Delaunay, Sonia Delaunay and Fernand Léger. 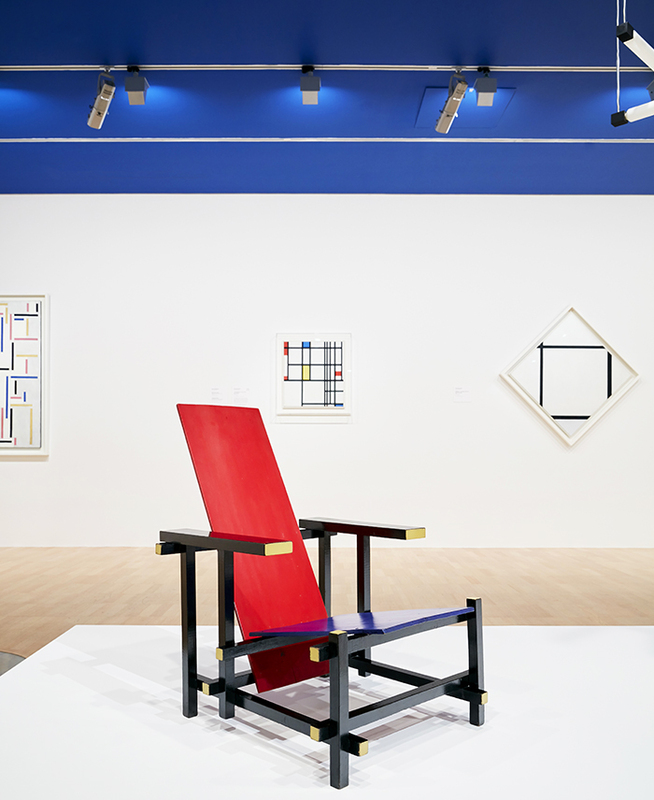 Part of the show at the NGV, Gerrit Rietveld's Red Blue Chair (designed c.1918, painted c.1923) and Piet Mondrian's Composition in Red, Blue, and Yellow (1937–42). At the NGV exhibition, a wall-sized version of Shigetaka Kurita 's Emoji (1998–99). Digital image The Museum of Modern Art, New York. Part of the NGV exhibition, Sven Wingquist's (Swedish 1876–1953) Self-aligning Ball Bearing (1907). Chrome-plated steel 21.6 x 4.4 cm diameter. The Museum of Modern Art, New York. 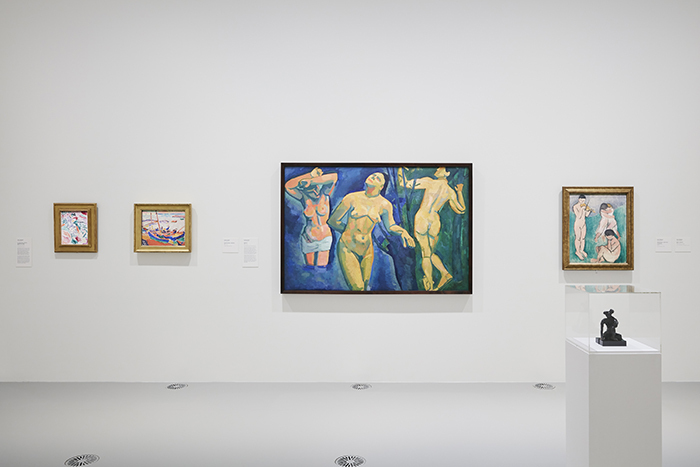 The MoMA at the NGV show, including influential works such as Andre Derain's expressionistic Bathers 1907 (centre) and Henri Matisse's Music 1907 (right).